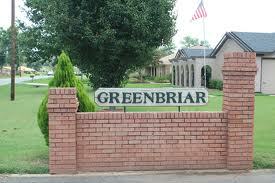 Greenbriar is a conveniently located neighborhood in North Bossier, nestled between Benton Rd. and Airline Dr. The ranch style homes that adorn it’s winding streets were built in the 60’s and 70’s and offer beautiful exteriors with spacious yards. It’s a quiet neighborhood as well, even though it’s located very close to I-220. This loop provides convenient access to a variety of popular locales in the Shreveport-Bossier Area such as the Casinos, Downtown, Cross Lake, I-20, the Louisiana Boardwalk and the Red River, and many others. And residents here don’t have to travel that far for several dining and shopping areas, since Greenbriar is between two of Bossier City’s most popular thoroughfares, Airline Drive and Benton Rd. It’s only a few minutes drive to Willis-Knighton Bossier, one of the areas best medical centers, and North Bossier is also home to some of the City’s best public and private schools. If you enjoy the outdoors, Bossier City offers Cypress Black Bayou to the north and Lake Bisteneau to the east, and the Red River to the west. These waterways are home to boating and skiing, fishing, duck hunting, and many other recreational activities, and the residents of Greenbriar are just a short drive to them all. With convenience like this, matched with suburban ranch style charm, Greenbriar is a neighborhood all its own.